The dates provided for the birth and death of “Father” and “Mother” on this page match perfectly with those of Laton Kanistanaux and his wife, Mary (Marleah) Moulton. This image came from a book titled “Mother’s Bible Stories Illustrated”, currently in the possession of a descendant of Caroline A. (Kanistanaux) Horton. Inside the cover is a wonderful presentation page which I will post at another time. The presentation page states the book was presented to “Miss Mary & Gracie & Leon F. Horton” from “Their Aunt Nettie Dodge”. I was unable to determine from the photos and internet research when the book was published or who the author was. Randy shared a total of 5 pages that contained family records. No marriage records are found on these pages and only one other death is recorded. All pages are written in pencil and there appears to be at least two different hands. 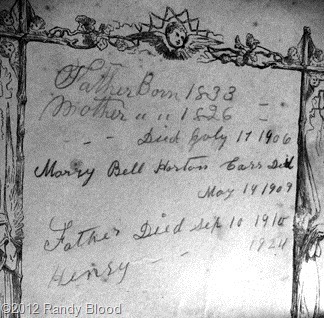 The handwriting on the presentation page and the handwriting on the above page appears to be the same except for the “Marry Bell” entry. The “M” in Marry is completely different from the “M” in Mother. The other pages appear to be written by the same person who wrote the “Marry Bell” entry. I am certainly not a handwriting expert and I do see similarities in several letter forms in both hands, so it is possible only one person made all the entries. Perhaps the entries were made at different times in the person’s life while suffering from some disability. I will leave it to the experts, but it does suggest some questions. Did Lee-o-netto write the presentation page? One would assume that she did, but I wonder. Did Lee-o-netto make the entries on the above page? Probably not. The death dates on this page are all after 1900 and after the book was given to the children. Why would Lee-o-netto make entries in the book beyond the presentation page and after the gift was made? If Lee-o-netto did not write this page and the presentation page, then who did? The only reasonable candidate would be Carry Horton, mother of the children named on the presentation page and assumed daughter of Laton & Mary Kanistanaux referred to as father and mother on the page. The most recent date is 1930. Carrie died in 1931, so she was available to make all the entries. Curiously, there are no pages or entries for Carrie and her siblings or for Carrie and her children. At this time I believe Carrie wrote the presentation page and the above page and perhaps Leon, his wife, or sister Grace made the other entries. I also believe the entries were made in batches rather than individually at the time of the event. For the purposes of this project, This document covers the following points of interest. It might be worth the time to learn more about Lee-o-netto’s religious affiliations, since church records might exist and could contain valuable information relating to her.